UCDA 2014 – Should Design Students Learn to Program? 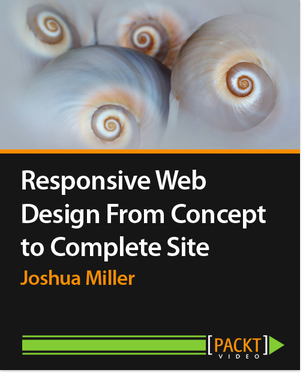 Responsive Web Design – From Concept to Complete Site starts with an overview of the technology, the best practices to follow, and then moves on to a complete implementation of a responsive site using HTML5 and CSS3 media queries. After learning the essentials of responsive web design in the introductory section, you will walk through splitting a mockup into images and content areas, defining a fluid grid using those divisions, creating a percentage-based layout for the fluid grid with CSS, and then begin creating a full-functional responsive page. The latter section contains hands-on exercises that will walk you through all the HTML5 and CSS3 code required to build your sample page. Created a new major which merges the web-centric skills taught in the Communication Design major with the technical outcomes taught in the Computer Science major. The goal of the program is to create a student who can create not only beautiful, usable websites, but also program dynamic interaction using both client-side and server-side technologies. A capstone course for the Web Development majors which focuses on the integration of the design skills learned in the Communication Design program and the programming skills learned in the CISC courses. In the course we work with clients to create a variety of web applications from the concept phase to mockups to database design to the final implementation. Though Interactive Programming is taught in the Design department, it is essentially a programming class. Students learn visual programming skills through the use of variables, loops, conditionals, keyboard and mouse events, and graphic programming techniques. Students build interactive video games from scratch using ActionScript 3 and build digital interactive art installation pieces, which a focus on generative art, using Processing and a variety of input & output hardware. A capstone class in the New Media curriculum, this course focuses on integration of design concepts: filming, editing, effects, and compositing. Students work in all forms of digital media and create a variety of animation and video projects using After Effects, Final Cut, PFHoe (match-moving), and animation tools. The web animation course combines traditional animation concepts, with interactivity concepts taught by means of ActionScript 3. The first half of the course introduces students to concepts of keyframes, tweens, easing, symbols, nested movie clips, and frame by frame animation. The second half of the course covers interactivity, ActionScript 3, buttons, listeners, and ultimately the creation of a fully interactive animated sequence. Bi-annual training courses for CSB, IPD, CSE, and IBE students instructing them on concepts involved in graphic design and creating graphics for print. The training sessions give an overview of Photoshop & Illustrator, as well as aesthetic and design principles for the creation of promotional posters. Taught an intermediate game design course, which melds the fields of graphic design, 3D modeling, and computer programming. Students storyboarded video game levels and characters, generated original 3D models, textured environments, and ultimately programed the dynamic logic for the game level. We used a variety of software packages including Blender, Maya and Lightwave 3D. This is a junior-level design course on web animation & interactivity using Flash CS3. The course covered topics various animation concepts, video and audio compression, and an introduction to Flash programming using ActionScript 3. The course is an introduction to geometric and subdivision modeling, lighting, texturing, and rendering techniques using Lightwave 3D. As a mandatory follow-up to the modeling course, this course covers basic keyframe animation using forward and inverse kinematics, as well as character animation using bone rigs, morphs, and weight maps. Covering concepts of graphic design while teaching Adobe Illustrator, this course content includes logo design, product design and packaging, vector illustration, and realistic illustration techniques using gradient mesh.